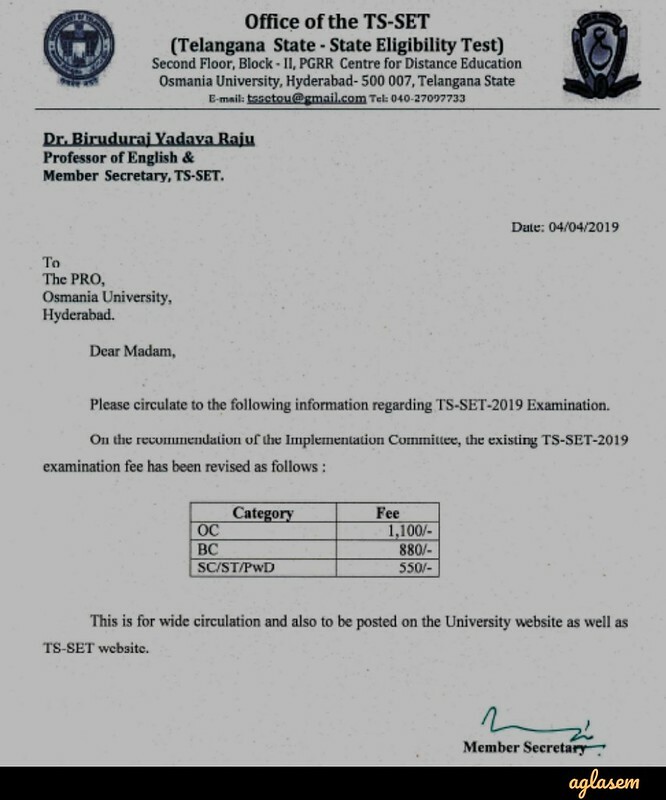 TS SET 2019 – Osmania University has revised the TS SET 2019 Examination Fee, scroll down to check the notice. The application form is available at telanganaset.org from March 27 to April 26, 2019. Telangana State State Eligibility Test 2019 on July 05, 06, 08, 2019 on the behalf of Telangana State Government. The notification of TS SET 2019 released on March 23, 2019. The candidates who have completed their Master’s Degree with at least 55% marks, can fill the form. The application form should be submitted in online mode. 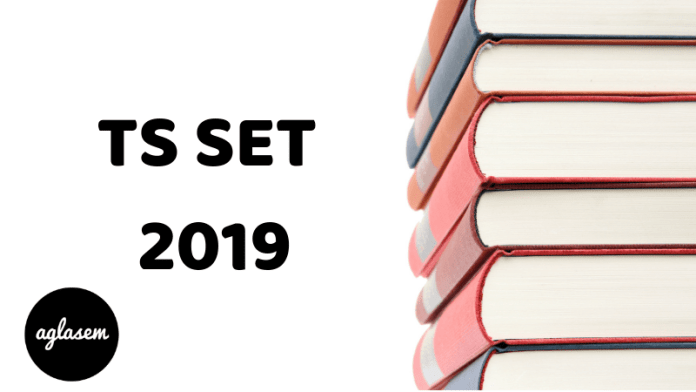 The TS SET 2019 will be conducted in 29 subjects over 10 centers. Get here all the details of TS SET 2019. Latest: The TS SET 2019 examination fee has been revised. Scroll down to check the same. The examination is conducted for determining the eligibility of the candidates as an Assistant Professor in the state of Telangana. The qualified candidates ascertain the eligibility certificate after qualifying the examination. The candidates who fulfill the eligibility criteria laid down by the Osmania university can fill the application form. The application form is available on the official website at telanganaset.org. For doing the registration the candidates have to pay the application fee. Apply Online: Click here to fill the application form of TS SET 2019. As per the category for the candidate, the application fee varies. Check the below table for the application fee. There is only one mode for the submission of the application fee. For online payment, the candidates can use the Debit Card/ Credit Card/ Net Banking. Additional charges will be deducted from the candidates account for making the online payment. Note: Once submitted the application fee is non-refundable in any case. The candidates who meet the following criterion can fill the form. Age Limit: There is no restriction of the upper age limit for TS SET 2019. Educational Qualification: The candidate possessing any of the following can fill the form. The candidate must have the post graduation degree with an aggregate of 55% for General, and 50% for reserved categories. The candidates who are appearing in the final year / have appeared for their qualifying Master’s degree / or their exam has delayed / or whose result is awaited can also apply for the exam. But they have to produce the degree certificate within the two years of SET Result. If such candidates fail to obtain the required marks will be treated disqualified even if they qualify the TS SET 2019. Here the candidate who holds the Ph.d. Degree who have completed their Masters before September 19, 1991, will be provided relaxation of 5% in the aggregate of their PG. The candidates should choose only those subject for SET, which they studied in the Masters. Those candidates who are having the pg diploma/degree certificate from the foreign university must ascertain the equivalence of their diploma/degree/certificate from the Association of Indian Universities (AIU), New Delhi. (www.aiu.ac.in). The aggregate marks should not be rounded off. Those who will the application for in time will be issued the admit card for the examination. The admit card for the TS SET 2019 will be released at the official website at telanganaset.org. The candidates will be able to download the hall ticket by entering the application number and password. It is mandatory to carry the admit card in the examination hall, otherwise, they will not be allowed to enroll in the examination. The TS SET 2019 examination is consisting of two papers, in which the paper I is compulsory & common, and paper II is elective. There will be only one session. It is compulsory to qualify in both examinations. Name of Subject from which the candidate can opt for paper II. The examination will be held in 10 districts of Telangana. The candidates have to choose the district in which he/she want to appear for the examination. The University will not entertain any quesris regarding to the change of examination center. Once the examination will be over the answer key will be released by the Osmania University. At first, the provisional answer key will be released. Later the final answer key will be released after the consideration of objections submitted by the candidates. The answer key will be released on the official website, in the form of pdf or login. The result of the TS SET 209 will be released after the successful completion of the exam. The result will purely depend on the performance of the candidates. In the among qualified candidates the number of candidates who will be awarded the Eligibility for Assistant Professor is equal to the 6% of total appeared candidates in both papers. The result will be declared on the official website. The candidates who will appear in the exam will be able to check the result. For more information about the TS SET 2019 download the information brochure.